One of the joys of being retired is that you get to do daytime things that you formerly had to pass on because you were in the office or traveling. Right now I’m helping to set up the annual rummage sale for my church, the First Parish of Sudbury. This fund-raiser, run by the Women’s Alliance, brings in donations of all kinds: clothes (of course), housewares, toys, office supplies, holiday decorations, books, DVDs, vinyl record albums, CD, pictures, costume jewelry and home improvement materials. we even have a spa table. The members of the Women’s Alliance spend three days setting it up before the doors open on Saturday morning at 9:30. That means opening boxes and emptying bags, sorting the donated goods, putting them on the right tables, and arranging them in a nice presentation. Certain items, like jewelry and the boutique table, are priced separately. Everything else gets priced by the bag. Fill up the brown paper supermarket sack with whatever you want and pay $5 per bag. It’s a bargain. While some people might see the set-up as a chore, I enjoy it. I usually work on housewares and toys but people often jumble up several items in one box so I do a lot of walking as I carry things to the right table. First, I like the treasure hunt. When you open a box or bag of donated goods, you never know what you will find. 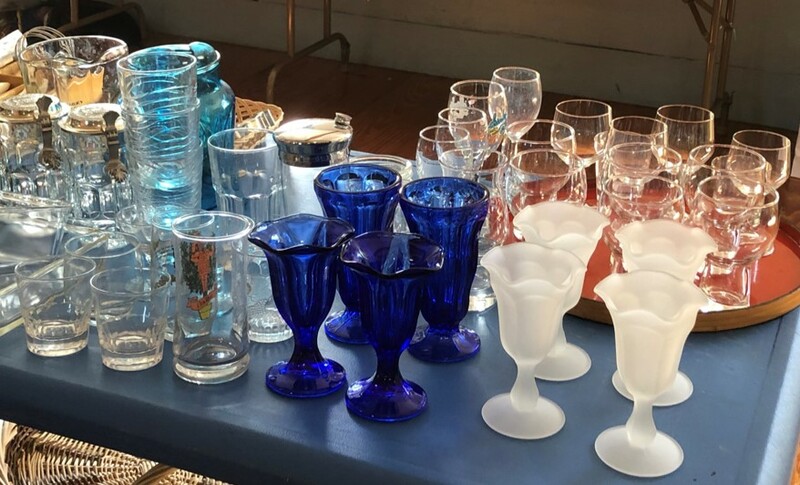 Sometimes you get old dishes and glassware, dusty with years of storage in a garage or basement. (If dead spiders freak you out, this job is not for you.) But sometimes you unwrap newspapers that are decades old, yellowed and brittle, and real gems come to light. 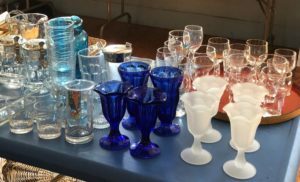 Yesterday I found sundae dishes in cobalt blue and smoked white glasses. We found a jewelry box still in the original container, Two knick-knacks, a bunny and a goose, appeared. A pretty red teapot, a white soup tureen, and a bright yellow candy dish got prominent places on the table. The easiest thing would be to just take things out and slap them down on the right table. But I spent my career in marketing and I know that presentation counts. So, I group things—dishes in one place, glassware in another, pots and pans in a third. That way people can find what they want or need without too much fuss and move on to another table. I don’t make it too easy, though: shoppers like to hunt for their own treasures, too. I set small things up on a box or basket or on an overturned box so they don’t get lost. Puzzles go in one pile, games in another. I put utensils in a vase and line up matchbox cars like they’re in a garage. It’s fun. 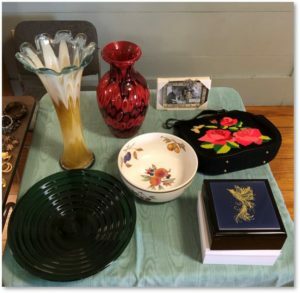 Things that emerge from a box lifted directly from garage or attic don’t gleam with care. They come adorned with dust, dirt, bits of ancient paper, old paper clips, and the aforementioned dead spiders. I operate on the theory that people are unlikely to purchase something so dirty they don’t want to pick it up. So, I spend some time washing and drying the nicest things, giving them an attractive sparkle. I hope buyers run them through the dishwasher at home but, in the meantime, they can at least imagine pouring wine into those glasses or scooping ice cream into those sundae dishes. 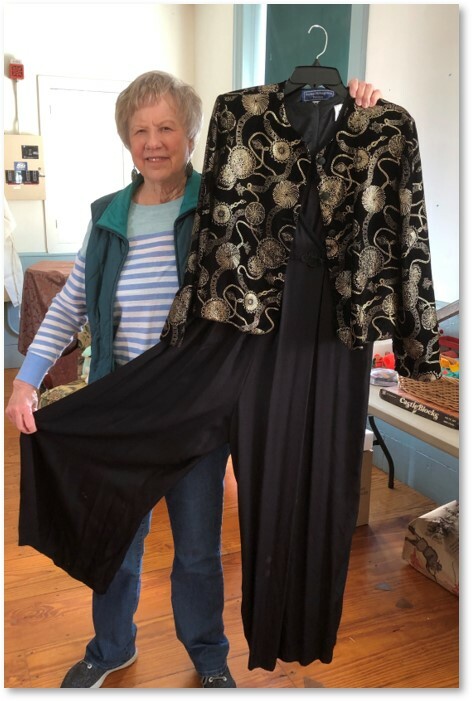 While I’m at work on housewares, other members of the Women’s Alliance fold clothes, line up handbags, put shoes in order, and ensure that the best and most unusual items go onto the hanging racks. The book lady organizes books or all kinds, along with electronic media and vintage vinyl. Everyone contributes to the boutique table. I try to stay away from the book table lest I be tempted to buy some. When it comes to the rummage sale, things leave my house; they do not come back in. Who Buys at the Rummage Sale? Collectors: People collect everything from fifties lunch boxes to Hummel figurines, Depression glass to antique dolls. The thrill of the hunt drives them to fill that gap in their collection or extend it to another area. Our castoffs are their treasures. Dealers: The professionals haunt rummage sales looking for valuable items being sold for relative peanuts. We try to stay on top of what is worth money but trends change and there’s just no accounting for taste. Teachers: Need paper, binders, dividers, pens and markers? How about holiday decorations for the classroom? Or books for reading time? 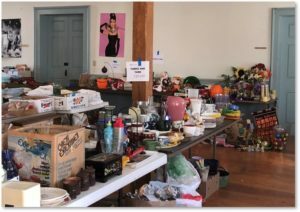 Teachers can find all of those things at the First Parish’s rummage sale. Our office clean-out is their educational supply. Crafters: Depending on what you create, we just might have something for you. This year’s sale offers ribbons, vases, baskets, candles, Christmas ornaments, and artificial flowers among other things. We cleaned up and you get the pieces to make new crafts. Householders: People who are setting up their first homes or replacing items damaged by fire or flood come to get the things they need to regroup and begin their lives again. Our things may not be brand new but they are in good shape and still have lots of life in them. Parents: Spring is time to refresh that tired puzzle collection, find new games, or replace worn-out sports equipment. Ditto the clothes they outgrew over the winter. 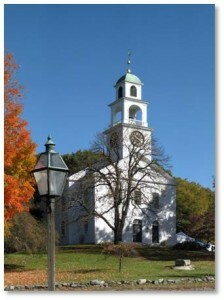 Our old stuff is their seasonal renewal. My rummage sale work will be done by Saturday morning but you can jump right in. . If you enjoy your own treasure hunt, join us on Saturday, April 13 from 9:30 am to 1:30 pm. Hint: come early for the best selection.